Amanda Milke shows off some of her artwork. Amanda Milke is a fan of “putting the kitchen sink” into her artwork. 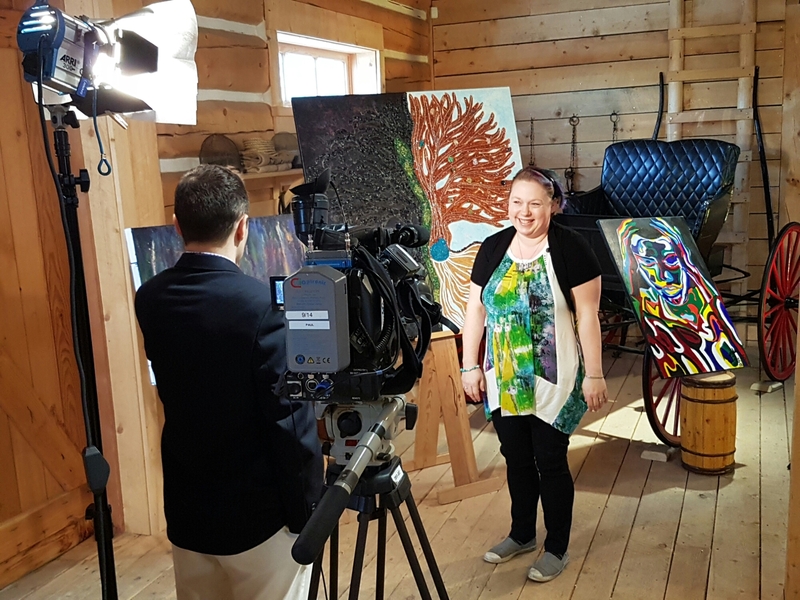 It’s a busy time for the Fort Saskatchewan artist. She has displays at MIX 107 and is the artist on exhibit outside of the Shell Theatre for the month of June. Milke is self-taught and discovered her love for painting in high school. She thinks it was about 1997. Now, she’s been voted in as the president of the Society of Fort Saskatchewan Artists. While she didn’t go to school for it, art is her life. When she’s not painting or doing abstract work, she runs a hand-stamped jewelry business and teaches classes. Opening minds to new and different aspects of artistic expression is what art galleries are supposed to be about. 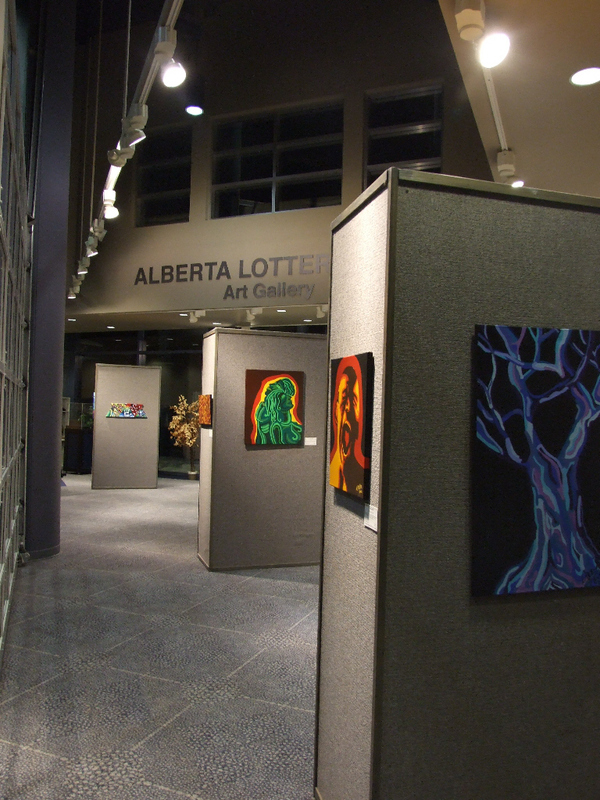 And this month, the Alberta Lottery Fund Art Gallery at the Dow Centennial Centre is expanding its boundaries and, for the first time, featuring work that pushes the line on abstract art. 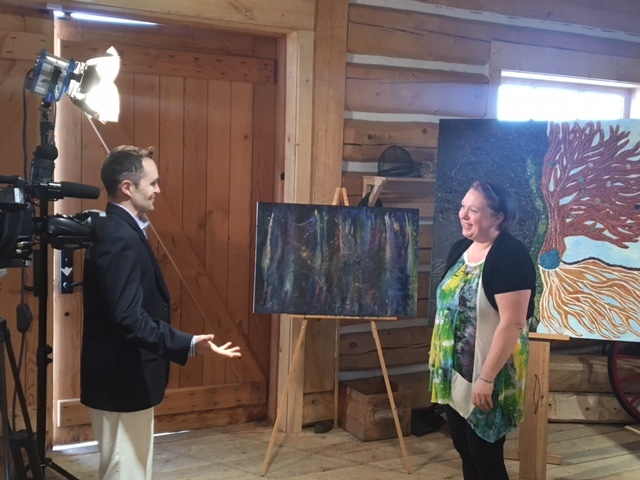 Amanda Milke, originally from Moncton, N.B., but now living in Fort Saskatchewan, approached the gallery about how to get an exhibit and was excited when she learned they would show her work this month. “I’m not really big on realism,” Milke said, who came to the city with husband Jonathan — who grew up in the Fort — about two years ago. “Some of the work I’ve done is simply my life experiences put on canvas. Other work is religiously inspired and some is just a means of venting.” Milke began painting around 15 years ago and quickly found doing still life rather boring. “That’s when I moved into abstract work,” she stated. “Some of my work are a definite departure, while others are done on the spur of the moment.” The exhibit, which runs each Thursday and Friday from 11 a.m. to 2 p.m. until Feb. 26 as well as prior to all Shell Theatre shows, is Milke’s way of getting out into the community.”This show is fairly groundbreaking, as it is the first time the gallery has shown abstract work,” Milke said.”My hope is that it breaks the perception of what is considered art and that helps people be more open.”As for reactions to her work, Milke explained she’s had a very mixed review so far.”Everything from people saying they really don’t like it — sometimes in a little more colourful language — to one little elderly lady saying, ‘Oh my gosh, that’s wonderful,'” she said. While the exhibit ends next week, Milke’s work can still be viewed on her website. 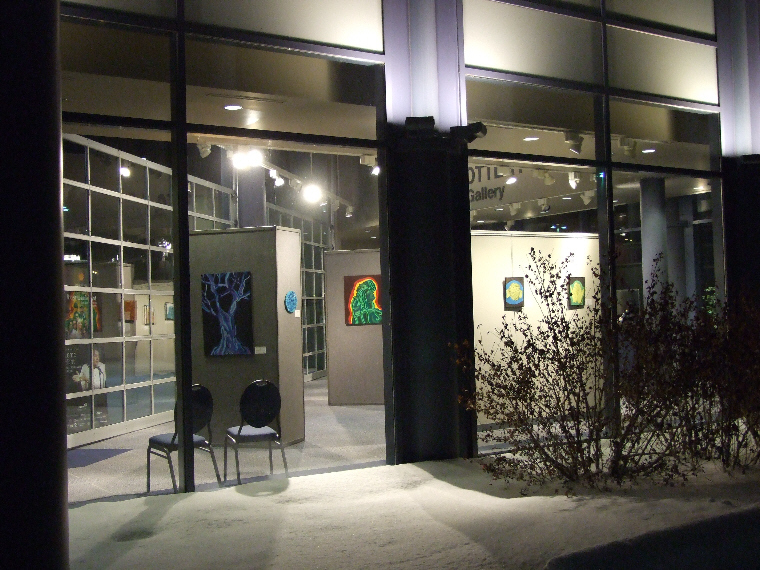 FORT SASKATCHEWAN, ALBERTA, (February 1, 2010) – The February exhibit at the Alberta Lottery Fund Art Gallery will feature both bold acrylics and soft watercolours by Amanda Milke. Amanda Milke’s art is diverse and colourful. For this exhibit, Amanda has chosen to show both sides of her painting: the bold acrylic and the soft watercolour. Each can be seen as intensely personal as each serves as an expression of a moment in her life and captures her emotions at the time of creation. Her watercolour work is split between two series, one ongoing and one a triptych (three panel work), all done with pen over watercolour. The ongoing “Life Simplified” series softly expresses those feelings that are part of a truly loving relationship and the deep needs that we all have, but cannot always express. “The Threefold Prayer” triptych expresses the core aspect of faith and a key way in which one should express that faith. Some of her acrylic pieces, like “Sara’s Prayer”, went onto the canvas essentially the way they were first envisioned. Others, like “Dark Winter’s Tree Before Spring’s Dawning”, evolved in the creation process, changing from what was originally intended as the artistic muse took over. Still others, like “Unexplained”, could never be more than abstract expressions of the very abstractedness of emotion. As such, these last are the purest expressions of her beliefs about art. Amanda feels that art must come from within as an expression of where an individual is. It is artists who pick up brushes to create impressions of that which everyone feels. In so doing, she feels that success comes when others look at her work and say, “I’ve felt that.” While her primary medium is acrylic, she enjoys experimenting with other media including watercolour and pen. She works primarily on canvas and coldpress paper, but she has been known to paint on driftwood, lampshades, instruments, and anything else that will hold the paint. Amanda Milke was born and raised in Moncton, New Brunswick and now resides in Fort Saskatchewan with her husband John. She has a BA in English and History, has studied at Oxford University in England and spent time in Japan teaching English and studying Japanese calligraphy. Amanda has an on-line presence in the art world and this is her second solo showing. She hopes to be able to talk with others about her work and maybe even see the thrill of emotional recognition in viewers’ faces. 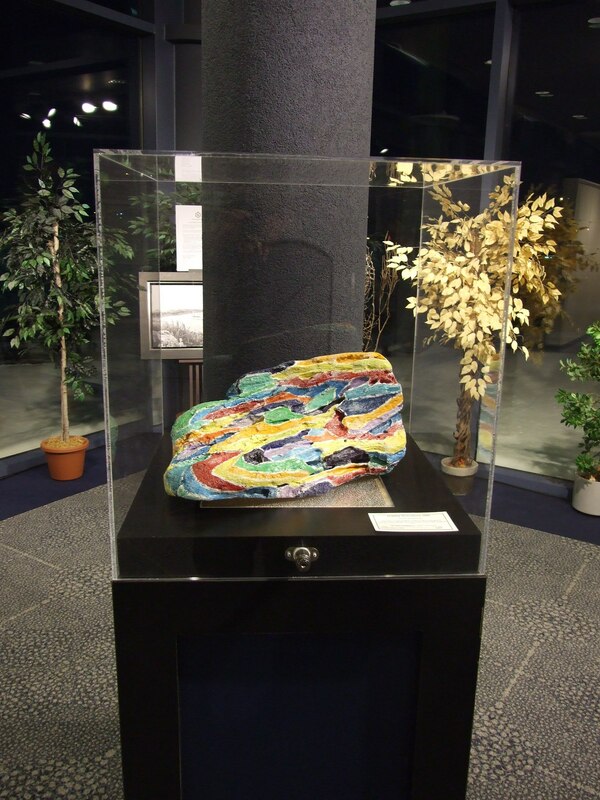 The exhibit is open to the public every Thursday and Friday from 11:00 a.m. to 2:00 p.m. from February 4th to February 26th and prior to shows at the Shell Theatre. M: When did you start painting/creating art? A: My first creations were done when I was 3 or 4 years old. I decided that the walls where we were living at that time desperately needed color, so I happily set about the task of brightening things up with my crayons. Of course, my mother didn’t share my artistic vision at the time and promptly had me wash away my masterpiece. I didn’t start painting until I was in High School. It was during that time that I completed several portraits both of others and myself in an attempt to explore different styles and mediums. That’s when I started painting with acrylics. A: Essentially my inspiration comes from life itself. My paintings are inspired by events that have happened in my life. They are reflections of the good and bad times, my hopes, desires, and fears, and as a result, each piece tends to be very emotionally charged. I’m able to look at any one of my paintings and tell you exactly where I was, what was happening in my life, and how I was feeling. M: Do you have formal training? A: No, I do not have any formal training; I’m a self taught artist. All of my post-secondary education came about as the result of different events in my life. Essentially what happened is after High School I got married with the hope of being a wife and raising a family. So, instead of getting my BFA, I decided to go to college and get an administrative degree. It was cheaper and faster and if I wanted to raise a family I’d need a steady income, not several years of debt. I ended up getting a good paying job right after graduation and started my newlywed life off as another faceless office employee. Two and a half years into the marriage I found myself still working the same meaningless job, still no family and my marriage starting to feel shaky. I decided that it was time for a change. After working in such a stagnant environment for so long I needed something intellectually stimulating so I applied to the BA program at the local Christian University and commenced my degree in September of 2001. A few months later, my marriage fell apart and I found myself divorced at age 22. One nervous breakdown and three paintings later I decided to finish my degree and pursue my art career on my own without the help of a BFA. Later that year, I met the man who would become my present husband. After graduating from University together, we obtained our TESL certification and moved to Japan for a year and a half. Now back in Canada, I am actively pursuing my dream of becoming a full time artist. M: From looking at the work, it seems to me that you like to use vibrant color schemes. What makes you choose/use those colors? A: I like to work with a vibrant palette because I find the colors to be more expressive. One of the key things I want to achieve with my paintings is that I want them to capture the viewers attention, and I feel the use of bold colors, particularly in my acrylic paintings, helps achieve that. The majority of these paintings are coming from a place that is deeply emotional and intense for me, and I want that to be captured even to some small degree in the subject’s artistic voice so that the viewer can get some degree of that personified in my art. When painting from such deep rooted feelings and emotions you develop a narrative that needs to be screamed about, not whispered. When I do use softer colors, I’m doing it intentionally as a means of expressing a softer and perhaps gentler side of life. An example of this would be the “Life Simplified” series. Although the pieces are still quite colorful, I used softer shades to express a simplified view of relationship aspects which my usual bold palette could not adequately capture. M: Even the black and white work have a high contrast and seem ‘vibrant’ – is their a significance to the definition of images and ‘pop’ (I’m not referring to pop art – I’m referring to the visual pop of the pieces) quality? A: When I work with black and white, I still like to maintain a level of boldness and vibrancy to the piece. I usually end up doing a black and white piece after I’ve completed one of my more colorful abstracts, as it serves as a visual break. As a result, the pieces tend to take on a more bare bones style. My objective when working in black and white is to simplify the subject down to what I consider to be the essential parts, and, by doing so, I’m hoping to allow the viewer the opportunity to see the basic beauty of the subject. Since it’s been stripped down, you’re left with a stark yet vibrant image that pops, and of course I’m still occasionally tempted to add a bit of “statement color” to the piece. M: Some of the work seems to be inspired by art that I have seen in religious institutions. They resemble stained glass and mosaics (I’m thinking Stations of the Cross in Catholic churches). Is some of those artistic forms an influence? If so, describe how you are re-interpreting those forms in both style and content. A: While I was growing up I did spend a lot of my time involved at a church and have always loved stained glass and mosaic works. However, I’d have to say that I don’t consciously draw from it. Coming from a Christian background and environment it no doubt influenced my perceptions. Perhaps being surrounded in that environment helped develop the style I use today, albeit unconsciously. As a result, I wouldn’t say I am re-interpreting those styles, but simply trying to flesh out my own. A: Well, I just finished working on a piece called “Blue Strum.” It is a commissioned piece that allowed me to re-create a broken acoustic guitar. But for the next month or so, I’ll be preparing my artwork to show at a local trade show. The majority of my energies will be funneled into getting everything ready for the show. I’ve already started working on a limited run of prints of previous pieces to sell, as well as a few new acrylic paintings. My hope is to sell some of my artwork and get a few more local commissions. That being said, I do accept international commissions as well and you can always see what I’m working on by visiting my blog. M: What would you like people to take away after viewing your art (taking into consideration that the artist does not control what the view takes away)? A: I guess what I want people to take away after viewing my art is the knowledge that each painting has its own emotional narrative painted into it, an artistic photo album depicting different aspects of my life, if you will. By sharing those experiences through my art with others, I hope to reflect what makes me the woman, the artist and the human being that I am, if only on a minute level. I’ve always felt that pictures speak more than 10,000 words and my hope is that I, as the artist, and you, as the viewer, can connect on some level that transcends language by evoking similar shared emotions. Amanda Milke imagines musical instruments in the bright colors of acrylic. Maybe I should say she re-imagines instruments in acrylic. An artist living in Alberta, Canada, Milke specializes in painting with acrylic. Her subjects include musical instruments. That is, she paints musical instruments. Sounds straightforward, doesn’t it? 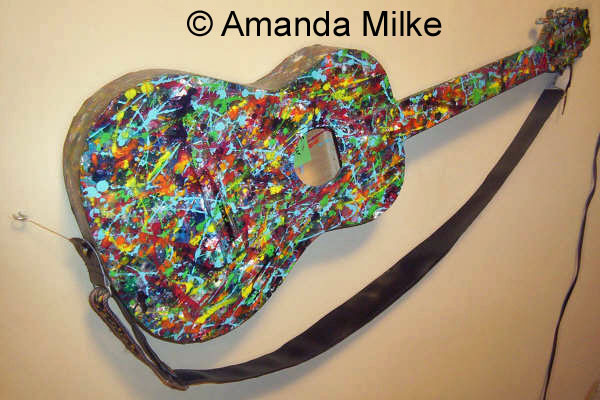 But when Amanda paints a musical instrument, the instrument is her canvas. The result isn’t just an object with paint on it, but a painting, albeit in an unconventional form. For example, her painting “Guitar” is a guitar. But it’s also a painting. It’s a three-dimensional work of art whose dimensions are determined by an actual guitar. The guitar itself has been reconfigured. It is a painting. As a painting, it is perhaps no longer a guitar. At the very least, it is more than a guitar. Just wanted to say thank you for your commission work. You were able to capture the colors and emotion I was looking for. I like your work! It’s bold and diverse! I love your stuff, it is a style that I really enjoy. Your watercolor paintings are like fingerprint whirls, each one unique and beautiful. I can’t believe you’re self-taught! Your work is beautiful! I love your use of color, so daring and expressive.